Vancouver Island golf courses are some of the best golf courses in British Columbia. Clustered along the 250 km Vancouver Island Golf Trail from Victoria in the South, to Campbell River in the North, these 13 Vancouver Island golf courses offer stunning ocean views, abundant wildlife and top notch hospitality. Dining, Nightlife, Romance: Victoria has it all! We invite you to these 13 golf courses in British Columbia. 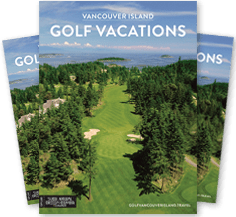 Voted #1 Island destination in North America and #10 in the world by Travel and Leisure magazine, and #2 Island destination in the world by Conde Nast Traveler Magazine, Vancouver Island is a golfing paradise! And Golf Magazine ranks Vancouver Island as “one of the best deals on the continent”. From the breathtaking beauty and incredible challenge of Bear Mountain Resort in the South to the opulence and luxury of Crown Isle Resort in the North, Vancouver Island has some of the best golf in British Columbia. The island golf experience means water, mountains, spectacular scenery, friendly people, abundant wildlife and gentle ocean breezes. From hidden gems to award-winning golf resorts, Vancouver Island has everything your golfing heart desires. This year and discover everything that a British Columbia golf vacation should be.